Unlike many newer branded kayaks, Airhead is actually an established kayak producer. So, being established, their prices are bound to be higher than the newer, less established brands. However, that price tag also brings forth great quality that has allowed Airhead to become an established producer. Though they have not been a company for too long, their solid fan base and excellent reputation have allowed them to make a name for themselves. They are considered to be a pioneer in inflatable water sports items, and more recently, inflatable kayaks. The Airhead Montana (AHTK-2) 2-person Kayak is actually a descendant of previous airhead inflatable models. This tandem allows you to have a great time without needing to be alone. Whether you bring along another adult, child, or even pet – you’re sure to have a great time on the water with this tandem. It is specially designed to be used on moderate whitewater and lakes. It is the perfect balance of performance of portability in comparison to other tandem kayaks. The inflatable seats are adjustable that also included a mesh pocket and a backrest. Three Boston valves as well as the nylon covers make it easy for inflation and deflation. Stretch net and d-rings placed on the stern and bow to aid in securing your gear. Grab handles allow you to easily put and pull the kayak in and out of the water. This tandem kayak is great for discovering otherwise inaccessible areas, camping, and vacationing. It is lightweight and easy to store, making it the ideal choice of equipment to bring along on your excursions. It’s specially designed to work great on moderate whitewater and lakes. You no longer have to strap a heavy and hard kayak to the roof of your car. Instead, you can simply place this in the car trunk, a suitcase, or even just a bag – ready for your travels. Just like any product, the Airhead Montana 2-Person has its advantages and disadvantages. Below, we have compiled a list of pros and cons to help inform your decision. The Airhead Montana has a great quality of build through the use of great materials. The use of heavy gauge PVC makes for an almost indestructible boat within its intended environments. The materials also give it a solid foundation which also enhances the performance. The fortified l-beam construction gives it the sturdy feel which means that, with proper care, it will last you for the years to come. The bottom floor of it is reinforced with tri-laminate and made tubular l-beam, which improves the tracking and the quality of the kayak. Airhead is known for providing excellent kayaks with all the bells and whistles but still remain user-friendly, which makes them great for professional and amateur kayakers. The large cockpit is especially great for beginner kayakers as it allows you to exit and enter easily. It is also more comfortable and less constrictive. The inflatable seats are also adjustable which allows them to be removed or moved around. Inflatable seats are also more stable and naturally comfortable, but the main advantage is the adjustable option to make them suit your needs best. The Montana is also fitted with an abundance of accessibility features, such as the grab handles for easy ins and outs. There are spray covers placed on the front and back to keep you, your partner, and your cargo as dry as possible. The neoprene elbow guards help you to balance comfortably. The six stainless steel d-rings help you secure your cargo to the kayak as well as being useful in securing your kayak to tow it if necessary. The gauge is also designed to help you inflate and deflate, while the multiple air chambers allow you to stay afloat even if one is damaged. This is actually bigger than most might expect. However, regardless of the size, it is a strong performer on moderate white waters and lakes. 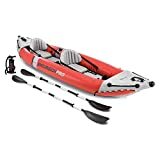 However, beginners should be cautious of taking this kayak, or any kayak, on white waters as they can get quite dangerous for those not accustomed. The color, a bright orange, is great for enhancing visibility at all times. It is agile, compatible, and lightweight, which means that it has a better navigation system. The flat bottom hull might not allow for great tracking, but it does allow great navigation. The kayak is hooked with a low drag and four bottom fins which make it simpler to keep it moving in a steady and straight line. Portability is one of the main purchasing factors of the Airhead Montana. Owners of the canoe praise the semi-rigid, heavy gauge PVC construction with UV and water-resistant coatings. All of that enhances the durability of the canoe. The additional tubular l-beam just continues to enhance the sturdiness, stability, comfort, tracking, and buoyancy. 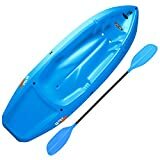 With the inflation taking only a few minutes, this becomes the ideal choice for travel-friendly inflatable kayaks. 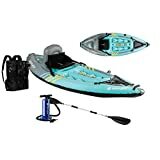 Hi Matt, I read ur review of the Airhead Montana kayaks. Would it be feasible to make one of those self-bailing by making more drain holes in the bottom – perhaps around the edges where the tubes connect to the floor (if there is space enough to do that)?